Marketers who wish to put their business information at easy to find places in homes of their prospects and value customers can benefit from its ability to stick. Although these 7.5 x 4.37 magnets are larger than regular business card magnets, still marketers can employ them as a plain business card or any other promotional item. You might have grown from a team of two to multimillion presence across the globe, still it is very important to introduce your business, whenever the opportunity permits. Do not stick to assumption that everyone knows about us, so there is no need to approach them. 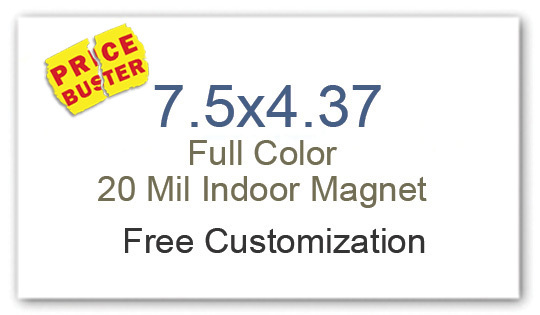 You can use 4.37 x 7.5 magnets for introducing your business to mass segment. Indulge them as calendar magnets, sales flyer magnets, business flyer magnets, mailer magnets, and more. By closely looking at the dimension, you might have understood that 7.5 x 4.37 is a bigger dimension. It is perfect for sharing vast body of information without second thoughts. Marketers can use it wisely to organize and express their business information in a user-friendly manner. They can design their rack cards and short brochures over these customized magnets. Today, businesses believe in building impact through entertainment or emotional texts, and they are already using it over other marketing mediums. By painting myriad colorful emotions and expressions, marketers can inch closer to their customers in a steady and natural way. They can use customized 7.5 x 4.37 magnets for sending holiday wishes, announcing their affiliation to community program, or offer them as fundraiser magnets. Holiday wishes magnets are being largely sought by businesses, which wish to build goodwill across the spectrum and stay in touch with their customers. Consider the following example – During a tradeshow, you come across two tradeshow booths selling same products – one is offering you 10% discount and other is plainly advocating their brand. Whom you would choose? Perhaps the first one who is offering discounts isn’t it? It is quite human to ache for savings or discounts during the purchase. You can easily attract customers to your business by announcing special savings, discounts, or other value added benefits. You can chalk out many other strategies success using customized 7.5 x 4.37 magnets. Remember magnet advertising improves your potential. In addition, you can save on art setup, online design proof, full color printing, and shipping by sourcing these customized magnets from any reputed online store.